Check out the official movie poster and trailer of the romantic comedy entitled "New Year’s Eve", originally intended as the sequel to the 2010 film Valentine’s Day. ﻿ The said movie will star Jessica Biel, Ashton Kutcher, Robert De Niro, Katherine Heigl, Lea Michele, Abigail Breslin, Hilary Swank, Michelle Pfeiffer, Zac Efron, Sofia Vergara, Halle Berry, Sarah Jessica Parker, Josh Duhamel, Ryan Seacrest, Jon Bon Jovi, Ludacris and Greg Kinnear. "New Year’s Eve" is directed by Gary Marshall (Pretty Woman, The Princess Diaries) and scripted by Katherine Fugate, the movie tells a series of stories about various characters in New York, and their relationships as they celebrate the beginning of the new year. 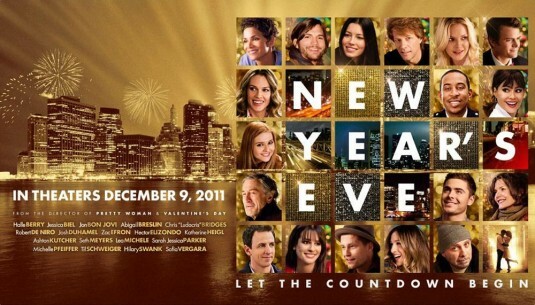 New Year’s Eve opens in theaters on December 9th, 2011.